Blog on science, news, curiosities and skepticism by science journalist and broadcaster Signe Dean. All views and opinions expressed anywhere on nevertoocurious.com are my own or, when quoted, belong to other people. They do not represent the views of any of my employers, nor any organisation I belong to. 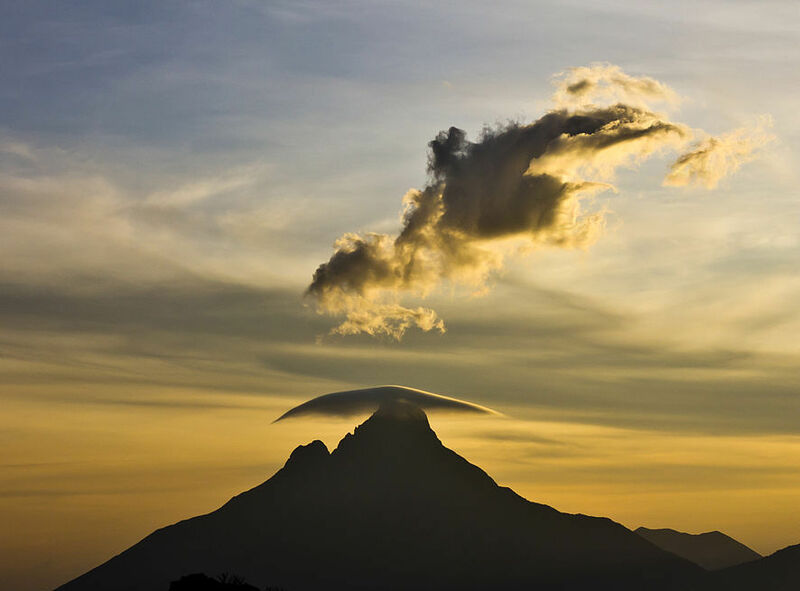 Virunga National Park Landscape - a lenticular cloud on top of a mountain - via Wikimedia Commons. I saw quite a fascinating cloud today – it was a medium-sized, round fluffball that looked so smooth and blurry around the edges you could think someone had taken to the sky with the blurring tool from Photoshop. It looked very much like a wad of cotton. Later tonight, when it was time to blog, I remembered the cloud and decided to look it up. This means engaging in a bit of nephology – “the study or contemplation of clouds.” I’ve since learned that compendiums of cloud types exist, where you can spend the better part of an hour browsing through images and matching the names of clouds with what you’ve seen in the sky. I diligently went through several of these cloud atlases, and I still have no idea what it was that I saw today. My best guess is that it was a type of a lenticular cloud – not as dramatic as a lot of the layered ones, but definitely with the characteristic smoothness of the edges. Like this one. Still, I did learn an awful lot about clouds today, like the fact they are divided into genera, species, and varieties. To read the definitions of each type of cloud, according to the “International Cloud Atlas” (1956), you can check out this website. This categorisation is based on factors like altitude, occurrence, and formation. For example, lenticular clouds form when a strong wind is interrupted by a tall geographical feature, like a hill or a mountain. This makes me sceptical that the cloud I saw today was indeed a lenticular one, but then, which other clouds have blurry edges? Bonus: for an incredible collection of well-classified cloud photos, Cloud Appreciation Society is the best source. Your email is perfectly safe with me.